Oracle E-Business Suite is the most complete business application in the market, as it is a reliable, modular and scalable ERP solution, which is why it is used by the most competitive organizations in the world. 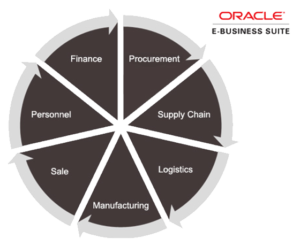 Oracle E-Business Suite efficiently organizes in modules all the information generated by the areas of Finance, Sales, Marketing, Production, Logistics, Supply Chain, Order Execution, Purchasing, Services, Maintenance, Product Life Management, Projects, Human Resources, and Business Intelligence, among others. Consult strategic information in a timely, integrated and coherent manner. Generate global reports of the company or departments. Analyze scenarios with respect to a business decision. Share information among the different departments. Create databases of customers and suppliers. The possibility of having real and current vision of the company. Better decision making based on relevant information. The automation and optimization of the company’s processes. The reduction of operating times and costs. A better quality in the elaboration of products or the rendering of services. Less time in the placement of products and services in the market. The traceability of the operation of the company. Directly compare multiple instances of the E-Business Suite, identifying the differences that may exist, which allows a quick overview of the changes that may arise after the execution of the process. Example: application of patches. Compare operative units, books or sets of books, in one instance or cross-sectionally in several instances. Creation of configuration copies at a specific date (baseline), allowing the generation of reports and comparisons of the historical configuration. Multiple report formats, including HTML, Word, Excel, XML.